Lamborghini has used this week’s Qatar Motor Show to unveil the newest limited edition package for the Gallardo – the LP 560-4 Bicolore. As the name suggests, the Lamborghini Gallardo LP 560-4 Bicolore is based around a special two-tone paint scheme with black covering the roof, pillars, spoilers and air intake openings in the lower fascia. The rest of the car is available in five colors, Giallo Midas, Arancio Borealis, Grigio Telesto, Bianco Monocerus and Blu Caelum (Yellow, Orange, Gray, White, and Blue) with unique Titanium-finished Skorplus wheels. Inside, the Gallardo Bicolore features a blacked-out leather and suede interior with stitch-work matching the chosen exterior color. Needless to say, I would go with Wiz Khalifa and select the Giallo Midas choice to sport the black-and-yellow theme. The Lamborghini Gallardo LP 560-4 Bicolore is powered by a 560hp V10 sending power to all four wheels but unfortunately, there isn’t a very good chance of seeing it cruising around your local streets – unless you are reading this in Europe or the Asia-Pacific region as the Bicolore is reserved for those two markets. The good news is that the North American market will get a Bicolore of our own, but it is applied to the Gallardo LP 550-2 package previously only available with the Balboni edition; offering 550 horsepower to the rear wheels only. 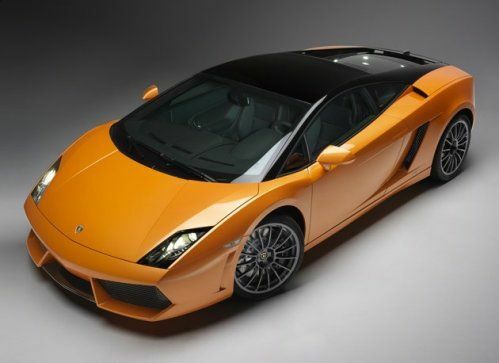 The LP 560-4 Bicolore is the latest in the steady stream of special, limited edition Gallardo packages as this model moves forward without the Murciélago. The Gallardo should soon be joined in the current Lamborghini lineup by the super-limited edition Sesto Elemento and the replacement for the Murciélago – the new LP 700-4 “Aventador”.